St. Louis Cardinals manager Mike Matheny's New York Times bestselling manifesto about what parents, coaches, and athletes get wrong about sports; what we can do better; and how sports can teach eight keys to success in sports and life. The tough-love philosophy Matheny expressed in the letter contained his throwback beliefs that authority should be respected, discipline and hard work rewarded, spiritual faith cultivated, family made a priority, and humility considered a virtue. In The Matheny Manifesto, he builds on his original letter by first diagnosing the problem at the heart of youth sports−it starts with parents and coaches−and then by offering a hopeful path forward. Along the way, he uses stories from his small-town childhood as well as his career as a player, coach, and manager to explore eight keys to success: leadership, confidence, teamwork, faith, class, character, toughness, and humility. From “The Coach Is Always Right, Even When He’s Wrong” to “Let Your Catcher Call the Game,” Matheny’s old-school advice might not always be popular or politically correct, but it works. His entertaining and deeply inspirational book will not only resonate with parents, coaches, and athletes, it will also be a powerful reminder, from one of the most successful new managers in the game, of what sports can teach us all about winning on the field and in life. Mike Matheny played thirteen years as a catcher for four Major League teams, won four Gold Gloves, and holds the MLB record for most consecutive games without an error. He was the manager of the St. Louis Cardinals for six seasons, leading the Cardinals to the postseason in each of his first four campaigns and winning the National League pennant in 2013. He and his wife, Kristin, are the parents of five and live in St. Louis. For more information about Mike’s Catch 22 Foundation, and to keep up with his blog, visit www.MikeMatheny.com. Jerry B. Jenkins is the author of twenty New York Times bestsellers, including the Left Behind series. His writing has appeared in Time, Reader’s Digest, Parade, Guideposts, and dozens of Christian periodicals. He has collaborated on as-told-to autobiographies by Hank Aaron, Orel Hershiser, Walter Payton, Nolan Ryan, Mike Singletary, and Billy Graham. For more information about Jerry, visit www.JerryJenkins.com. "Lots of coaches write inspirational books, but this one has a lot of interesting stuff in it...It's an important book." "A must read for parents, coaches, teachers all who work with young people"
[The Matheny Manifesto] should be read by every parent of every youth league player in this country. 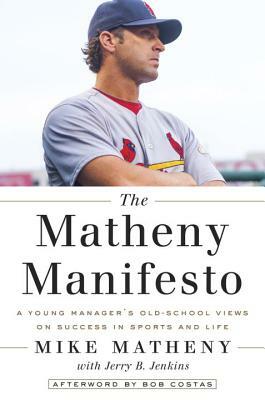 "Every parent who has a son or daughter that plays sports, dances, plays in the band, is in theater, or does anything as team or group, must read The Matheny Manifesto."